Bicycle Fixation: Bakfietsen to the Future! I found out that my girlfriend was pregnant in the Spring of 2007. A few months later, the reality of the situation started sinking in. I would have to move out of my apartment. The Bike Oven, which had been going strong in my garage for almost two years, would have to find a new home. Once my girlfriend sold her car, we were left with just my Honda Civic. Our families and (non-cycling) friends kept mentioning our need for two cars. Having a kid, to these well meaning folks, meant we'd have to cart the kid and a trunk load full of crap around Los Angeles County for the next few years. I felt trapped. The last time I had to drive a lot in my everyday life (for a job 30 miles away from where I lived), I turned into a chubby, hateful, angry version of myself. How could I possibly avoid becoming a fat, hateful, angry person? Bicycling has really been my salvation since I moved away from the beach to Highland Park. I got so into the social bike scene that I started a bicycle repair cooperative! In search of an alternative to buying a new car, I spent a lot of time online looking for a way to get a kid around by bicycle. 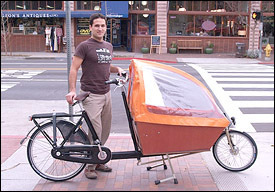 The bakfiets seed was planted in my mind a year prior, while watching "Contested Streets." A segment of that film chronicles the transportation network in the city of Copenhagen in Denmark. A mother in the film demonstrates how her "special bicycle" allows her and her son to get some exercise and fresh air, with her son sitting in a large box in the front of her bicycle. The image this conjures up in most people's imagination is not a safe nor positive picture--but seeing it on film, and doing more reading about Dutch and Danish cycling--made me think that this might actually be a good way to get a kid, and a trunk load of stuff, around Los Angeles County for the next few years. There were two retailers of bakfietsen I found on the web: Clever Cycles of Portland, Oregon, and Rain City Bikes in Vancouver, British Columbia. Bakfietsen come in "long" and "short" versions. The difference is roughly a foot of extra bike on the "long" version. Both companies offered their "long" bakfiets for around $3000.00. Buying this version of bakfiets typically included a few extras--like a nice Brooks lather saddle. If you're going to buy a bakfiets, and ride it regularly, you're going to need a rain shield, which costs extra, but keeps your kid(s) and stuff dry. Depending on which retailer you bought from, this ran around $250.00 to $300.00. 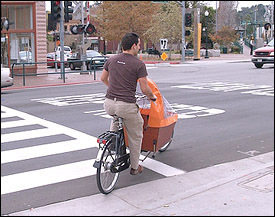 Then there is the cost of shipping that bakfiets, which weighs around 100 lbs. If you can get the bike delivered to a business address, you can save a lot of money in shipping charges. If you get it delivered to your house, expect to pay $500 to ship a bakfiets to you (on the west coast of the U.S. at least) from either Clever Cycles or Rain City Bikes. I chose to go with Rain City Bikes, and the guys who run the shop were really quite nice--especially because we all had to deal with a few big annoyances in getting money to them across the U.S./Canada border, and more annoyances and delays in getting the bakfiets to the Bike Oven in Los Angeles. Once the bike arrived, I had to assemble the box, kickstand, handlebars, front wheel, front fenders, and light. As large as the bakfiets is (it's around 9' long), it is surprisingly nimble. Everything that can be shielded from the elements, is: all the gears and brakes are inside the hubs. The tires, Euro-favorite Schwalbe Marathons, look pretty damn bullet proof--and they have a reflective stripe that runs the circumference of the tire on each side. 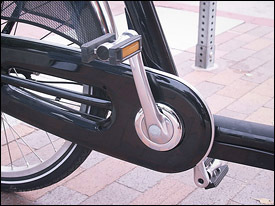 They have inner tubes with a "Woods" valve--which fits a Presta pump fitting, but is a very rare valve type in the U.S. I'll probably have to find some Schraeder replacement tubes for the day I pick up a flat and need a quick fix. The amenities of a practical Dutch-style bicycle cannot be praised enough in my opinion. The bicycle has a very bright dynamo powered front and rear light (both powered by the front hub). 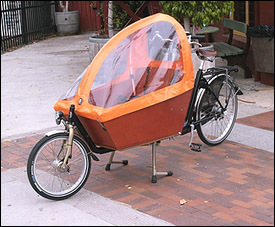 The bakfiets also has a locking rear wheel and an incredibly sturdy rear rack that came with a monstrous bungee cord. The chain is enclosed, and the rear wheel even has a skirt (or kilt?) guard. Fenders are a complete afterthought on bicycles in the U.S., but this bakfiets came with a fine pair of shiny fenders as well. The whole thing is well assembled, and the paint and finish on the bike make it look like it can take a severe beating from harsh weather and riding conditions. I've ridden close to two hundred miles since it arrived a few weeks ago. I've ridden the bakfiets up and down hills, and to the beach and back (which took about two hours each way with stops for cookies and tea). I've used it to transport kids, a few (sub-200 lbs.) adults, and whole lot of beer. I think I've found a way to live my life on my own terms. I feel the bakfiets is safe. I know that it is a fun, and civil, way to get around town. As I've ridden past gas stations with ever rising prices, I can't help but feel like I've made a good decision. I hope that my daughter will feel the same way.